Having faced the Montreal Canadiens once before during the 2014-15 season and coming away the hard luck losers in a 2-1 shootout loss, the Sabres wanted redemption this weekend. 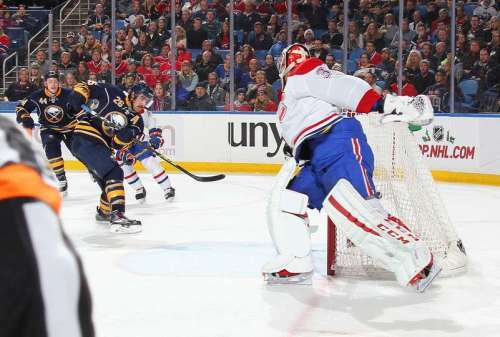 Friday night (November 28th) was the first game of a home-and-home series between Buffalo and Montreal, and the Sabres started off the weekend with the best result possible – a 2-1 regulation win. Wednesday’s loss to the Winnipeg Jets ended a three-game winning streak for the Sabres. Buffalo had just 20 shots on goal, and Chris Stewart scored the only goal in a 2-1 loss. Friday, the Moulson-Girgensons-Ennis line made its return to the points column. That line alone has 17 of the team’s 37 total goals. Ennis leads the team with seven goals, and Girgensons is just behind him with six. Ennis was the first to score in Friday’s game. His goal was a thing of beauty. The initial shot was blocked, but Ennis was able to control the rebound and then backhand it into the net as he fell to the ice and slid into the boards. The excitement of the way the goal was scored was only matched by the excitement of an early Sabres lead. A fight added to the excitement. Both Buffalo’s Chris Stewart and Montreal’s Brandon Prust had been ready for much of the period. With 14.2 seconds to play in the first, Stewart and Prust dropped the gloves off the faceoff and exchanged punches for over a minute until they tired themselves out. With a pat, both men skated for the locker room. Prust apparently hadn’t gotten rid of all his frustration in the fight. Near the end of the second period, it appeared that Prust disagreed with an offsides call and let the referee know about it. When he continued to make himself heard, he was escorted off for a game misconduct penalty. Prust-less Montreal tied the game just 1:35 into the third period on a debatable goal by P-A Parenteau. Jhonas Enroth covered the puck with his skate, but the whistle he was hoping to hear never came. As he attempted to move the puck from his skate to his glove, Parenteau reached out and poked the goal in. Enroth wasn’t happy about the goal and the lack of a whistle, but he wasn’t too surprised. There was one call, however, that led to the Sabres’ game-winning goal. With just 1:54 remaining in the third period, Alexei Emelin delivered a huge hit on Brian Gionta. He made contact with Gionta’s head, and Gionta came up fighting mad. Emelin went to the box, the official call “illegal check to head,” and the Sabres were given a game-ending power play – in more ways than one. Less than a minute later, it was Moulson who put the puck in the net for the game-winner. After missing chance after chance during the rest of the game, all he had to do for the game-winning goal was guide the puck into the empty net. Montreal goalie Carey Price had gone behind the net to play the puck, but he hadn’t anticipated the funny bounce the puck would take off the boards, a bounce that would send it right to Moulson’s stick. Moulson said he’ll take the goal, however it came. Tonight’s game gave the Sabres a win in four of their last five games. A win in Montreal would give them the third straight sweep of a home-and-home series against the Canadiens. The Sabres no longer have the fewest points in the NHL. That honor belongs to the Columbus Blue Jackets with 14, while the Sabres and Edmonton Oilers each have 16. The Sabres are now 7-14-2, which brings a little hope to the current stretch. Montreal fell to 16-7-1 with the loss. Buffalo will look to continue its winning ways and end November on a high note Saturday in Montreal at 7:00pm.